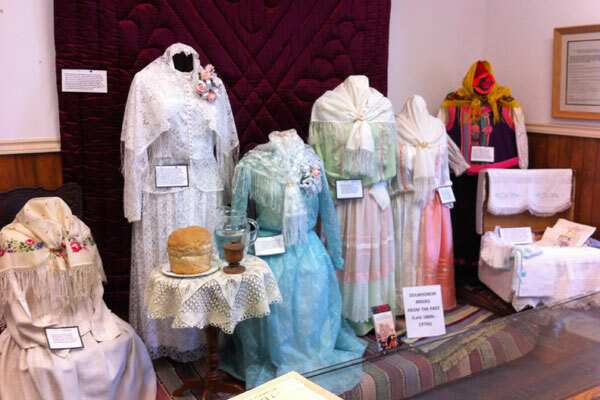 This year's CIS Art Walk exhibit at the Railway Station Museum in Castlegar features Doukhobor bridal fashions from the late 1800s to the 1970s. Included in the display is an explanation of each costume and time period, as well as a sample of the traditional "hope chest" prepared by young brides-to-be and their mothers. The setting also includes a table with the Bread, Salt and Water, and the significance of these items in formal Doukhobor ceremonies. Doukhobor handcrafted artifacts represent a significant tradition of skills brought by our ancestors from Russia. 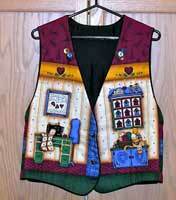 Although more recent handicrafts may have been inspired by published patterns, these heritage pieces showcase the unique talent of the Doukhobors. Some of the earliest crocheting was used as edgings and borders on woolen "zanaveski" (aprons) and bed linens, as well as inserts for miscellaneous linens and camisoles. 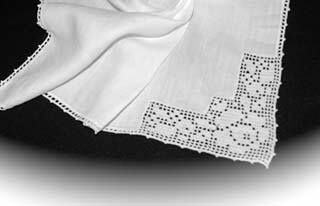 After the 1940s, crocheted doilies, tablecloths and runners became very popular. Other household linens such as tea towels, aprons and pillowcases also had beautiful crocheted edgings. Now, many vintage Doukhobor crocheted doilies are incorporated into creative projects as embellishments for clothing, quilts, quilted table runners, shopping bags and art pieces. 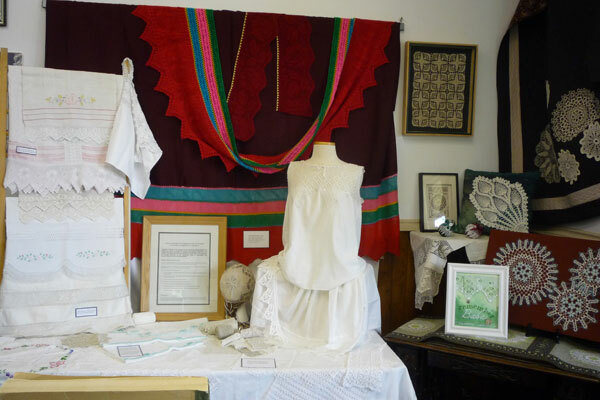 The Doukhobor Cultural Interpretive Society's submission for ArtWalk 2014 was an exhibit of vintage crocheted art as well as ideas for upcycling these treasures. As a participant in the Castlegar Arts Council 2014 summer Art Walk (June 23-Sept 14), the USCC Cultural Interpretive Society's contribution was displayed at the Castlegar CPR Train Station Museum, 400-13th Avenue, Castlegar, B. C.
The USCC Cultural Interpretive Society believes that our Doukhobor heritage is unique and irreplaceable. 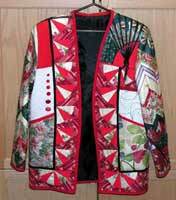 Over the last decade, through the generosity of our many donors, we have acquired heritage clothing and various fibre arts items. Through this legacy of physical artifacts, we hope that present and future Do ukhobor generations value the importance of preserving and displaying items from our past - a valuable learning experience! The featured bridal outfits date from the late 1800's to 2012. Inspired by the “tree” graphic in the fundraising campaign pamphlet, Selkirk College and the USCC Cultural Interpretive Society (CIS) established a partnership to recognize the first 100 donations of $100.00 or more made to the Lecture Series Endowment fund at Selkirk College. 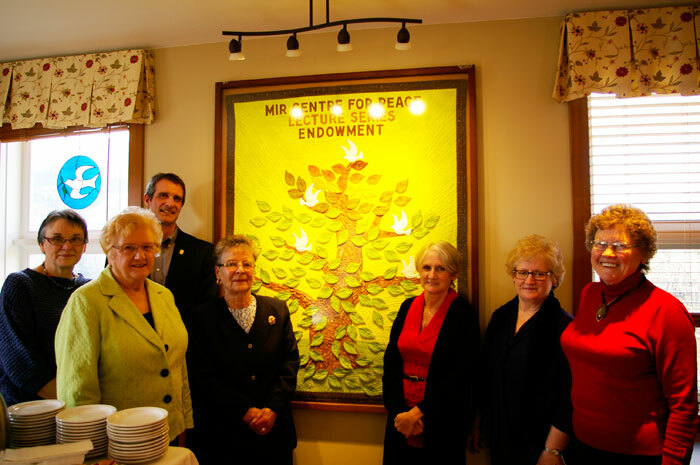 CIS volunteers, Joy, Paullette, Mary and Verna created an artistic wallhanging with the contributor's names machine embroidered on individual leaves producing a three dimensional image. 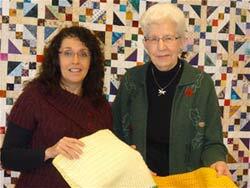 This “quilt” was unveiled at the MIR Centre at Selkirk College on January 23, 2014. Paullette Markin, Verna Chernoff. Missing from photo: Joy Rogers, who along with Mary, Paullette and Verna, created the “work of art.” - Hand-dyed background by Timmy-Jean Tack. On May 8, 2013, the Cultural Interpretive Society hosted a group of approximately 30 seniors from Nelson's Learning In Retirement program on their field trip to become better acquainted with the Doukhobor culture. They toured the Brilliant Cultural Centre first, including the ISKRA office and the Children's Preschool and were exceedingly pleased to see the bread-making in progress. Many came away with loaves of fresh baked bread! They then proceed on to the USCC Doukhobor Arts and Crafts Centre where they visited the Kootenay Men's Group in the woodworking area and the Cultural Interpretive Society to see the various fibre arts projects. It was an educational and very enjoyable time for everyone involved. On March 9, 2013, the CIS held a special raffle with a tribute to a talented woman who emphasized the importance of preserving traditional Doukhobor fibre art skills. 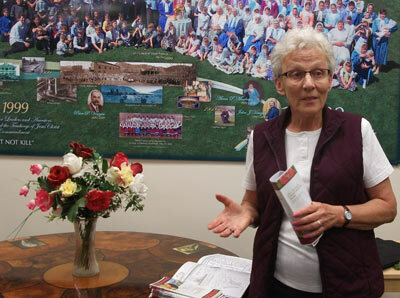 Mabel Verigin (1935 – 2010) was a great ambassador to this cause. - Victor Relkoff – consolation prize – rug, (no photo) woven by Mabel In Mabel's memory. 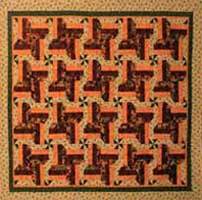 The proceeds of this raffle will fund a decorative quilt wall rack to be built at the CIS to display the many quilts that the volunteers make today. Leanna Kozak, Program Manager of the RCMP Victim Services shared information with members of the Cultural Interpretive Society about the Victim Services program which has been in operation since September 1993. The mandate of the program is to offer assistance to individuals and families who have suffered from or witnessed a crime and/or trauma, and inform them of their rights under the Victim of Crime Act. The services provided are: emotional support, referrals to community agencies, giving information about the justice system and the police investigation, court orientation and accompaniments, assistance filling in Crime Victim Assistance applications and Victim Impact Statements, and providing crime prevention information. The Cultural Interpretive Society serves as a liaison between Tillie Howe, a local senior, who crochets afghans for "people who need them," the individuals who would find comfort in an item made by someone who cares. Leanna Kozak accepts these afghans from Tillie to be given to individuals, often children, for emotional support in traumatic situations.